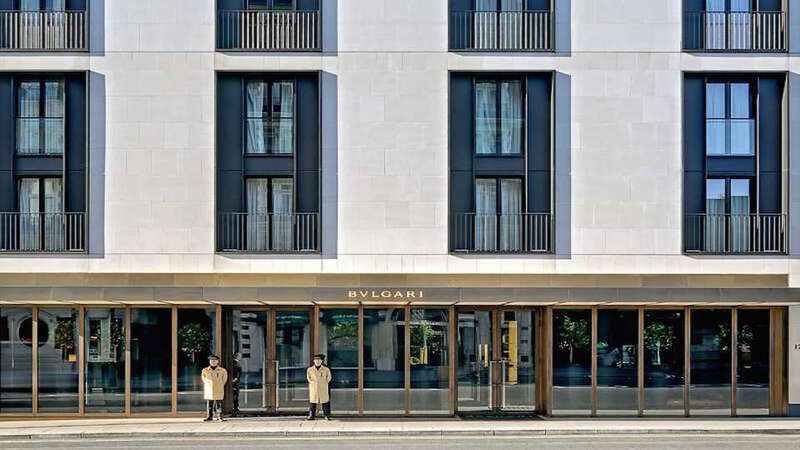 We became addicted to it in Bali and made Milan even sexier, Bulgari Hotels arrives to the British capital as an embassy of cool Italian design fostered in a commercial section of Knightsbridge. Its façade puts a modern spin on art deco meets Fascist design, a simplistic entryway of revolving steel door leads to a reception of matte black stone floors amongst grand colonnades surrounded in glossy wood paneling and silvery chrome details. The in-house restaurant features its own entrance with décor inspired by 17th and 18th century silver pieces from the Bulgari collection with spiral staircase that connects to an upper level lounge with modernist nickel bar surrounded in a black-palette of art-deco furnishings. A true spa hotel like its Milan and Bali sibling, the London property features two dedicated floors of onyx and Vicenza stone with swimming pool, thermal experiences with ice fountains and cooling showers that's one of the largest and chicest in London. With a total of 85 guest rooms and suites, Bulagri Hotel London is defined by a minimalist and textured design statement of simple furnishings with robust design details like glossy oak paneling and black granite. Entry-level rooms mix plushy gray tones with patterned curtains and simple seating area surround a Queen-size bed. Bathrooms feature black Marquina marble with separate showers and bathtub complete with Bulgari Green Tea bath products. Spare-no-expense suites with on-demand butler service are where the true magic of designer Antonio Citterio with well-planed space framed in vintage mirrors, Moroccan rugs and long bookcases arranged in pottery and collectibles.